This weekend only, Old Navy adult jeans are all 25% off. Click on and print the coupon at right to get this deal. Expires Aug. 29, 2010. One time use per person. 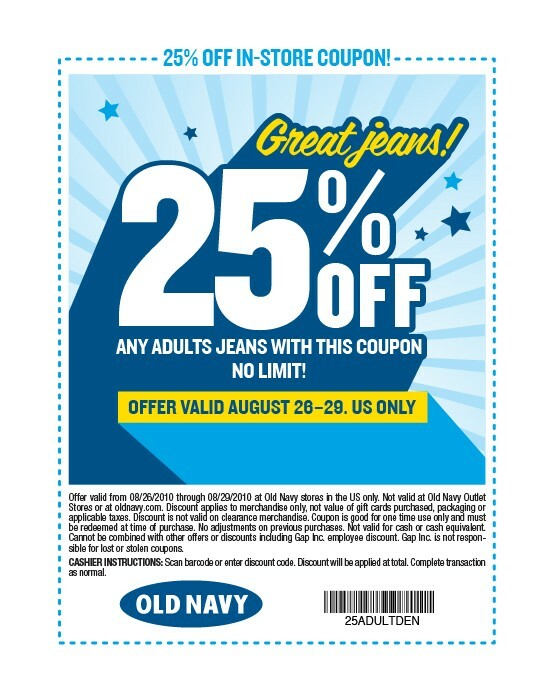 There is no limit to the number of jeans you can use this coupon for. Can you say fall jeans run? Caveats: not valid online or at Old Navy Outlet. Not valid outside the U.S. Not valid on gift cards, packaging, taxes, clearance merchandise or previous purchases. Cannot be combined with other discounts or offers.